Naomi Stead is Professor of Architecture at MADA (Monash Art, Design and Architecture) in the Department of Architecture at Monash University, Melbourne. She is also an Adjunct Professor in the School of Architecture at the University of Queensland. Her research interests lie in the cultural studies of architecture - in its production, reproduction, and reception, and the place of architecture in the broader cultural imaginary. Current research projects examine experimental writing practices in architecture, and the representation of architecture and architects in popular media. She was a co-investigator on the ARC Discovery project 'The Cultural Logic of Queensland Architecture: Place, Taste and Economy' (2011-2014) with Prof John Macarthur and Dr Deborah van der Plaat, and was the leader of the ARC Linkage project ‘Equity and Diversity in the Australian Architecture Profession: Women, Work and Leadership’ (2011-2015) which led to the founding of the award-wnning website Parlour: Women, Equity, Architecture, edited by Justine Clark. Having been trained as an architect at the University of South Australia, Stead received her PhD from the University of Queensland, and has taught at the University of Technology Sydney, and the University of Queensland. Her doctoral thesis, ‘On the Object of the Museum and its Architecture’ (2004), examined the cultural politics of architecture in recent, purpose-built social history museums. Stead edited the 2012 book Semi-Detached: Writing, Representation and Criticism in Architecture (Uro, Melbourne, 2012). She was from 2012-2015 co-editor of Culture Unbound: Journal of Current Cultural Research (Norrkoping, Sweden), and from 2011-2014 editor of Architectural Theory Review (Sydney). Stead has been a visiting postdoctoral fellow at the Advanced Cultural Studies Institute of Sweden, and a UQ Postdoctoral Research Fellow. Her scholarly work has been published in anthologies such as Critical Architecture (Jane Rendell et al. eds, Routledge, London, 2007), Architecture and Authorship (Katja Grillner et al. eds, Black Dog, London, 2007) and Architecture, Disciplinarity and Art (Andrew Leach and John Macarthur eds, A & S Books, Ghent, 2009), and Mongrel Rapture (Mark Raggatt and Matiu Ward eds, Uro, Melbourne, 2015). 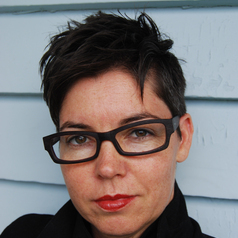 She has published in journals including the Journal of Architecture, Volume, OASE, Performance Research, JAS: Journal of Australian Studies, Fabrications, and Critical Studies in Television. She is a past Editorial Board member of the Society of Architectural Historians of Australia and New Zealand, and has edited three volumes of conference proceedings. She has supervised eleven PhD and research Masters students to completion, and been a keynote at Australian and international conferences. Stead also maintains a number of ‘para-academic’ writing, exhibition, and art projects. These include the 2009 exhibition ‘Mapping Sydney: Experimental Cartography and the Imagined City’ at the UTS DABLab; the 2015 exhibition 'Hung Out to Dry: Space, Memory, and Domestic Laundry Practices,' with Kelly Greenop and Allison Holland at the UQ Art Museum; the 2015 exhibition 'Portraits of Practice: At Work in Architecture' with Justine Clark, Maryam Gusheh and Fiona Young at the Tin Sheds Gallery, Sydney. In 2009 Stead made a series of short films for the UTS Equity and Diversity Unit in collaboration with Sam Scotting; she has an ongoing writing collaboration with Dr Katrina Schlunke of UTS; and continues an ongoing visual research project Documentation: The Visual Sociology of Architects. Stead is widely published as an art and architectural critic, having written more than fifty commissioned feature and review articles in industry magazines. These include Places Journal (for which she is a columnist), Architecture Australia (of which she was a contributing editor 2003-2012), Architectural Review Asia Pacific, Monument, Artichoke, Pol-Oxygen, and [Inside]: Australian Design Review. In 2008 she was awarded the Adrian Ashton Prize for architectural writing by the NSW chapter of the Australian Institute of Architects.